When people set about to make a change of any kind, especially when it comes to their health, their focus tends to gravitate toward a very long list of things they feel they will have to sacrifice. By doing so, they inadvertently attach a sense of negativity to the process of behavior and lifestyle modification. This will ultimately discourage, rather than encourage progress. Additionally, anything that evokes the feeling of restriction is not typically sustainable for any length of time. Once the excitement of change fades, motivation fades as well. At that point, all that is left is the draining burden of restrictive activity. It’s not an all or nothing approach. Knowing this will keep you from becoming overwhelmed. It is practice over time. Mostly, it’s a mind battle. It is in the seemingly small positive choices that the larger conquests are made. It’s simple, but it’s also not. In his book The Slight Edge, Jeff Olsen explores in detail the principle of compound effort over time. It’s not a new concept, but it is one that we all too often fail to capitalize on. Each forward step makes the next step seem a little easier. Continue taking steps, and before you know it, you will have covered terrain you never would have believed you could. 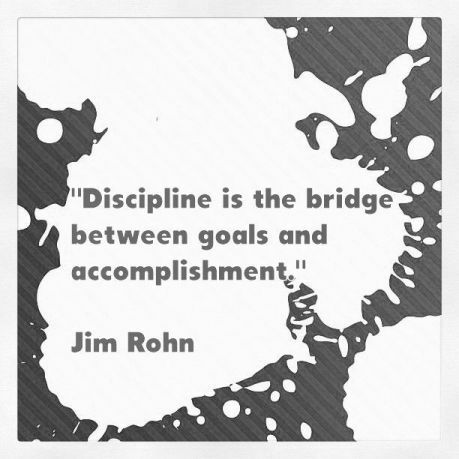 All areas of life benefit from discipline. Whether we recognize it or not, they are all interrelated. The concept of wellness involves continual growth in aspects of the physical, intellectual, emotional, relational, spiritual, and vocational. When we begin to practice purposed growth in any one area, it carries over to the others, and serves in their development. The advantage becomes apparent when you understand that any advancement made in areas of higher competence can positively influence and encourage progress in those areas with which you are not as comfortable. When you utilize this approach (what I refer to as the process of being an intentional ‘work in progress’) your full potential becomes attainable. Each small step forward in discipline brings a new level of confidence in one’s ability to handle the next challenge. The energy that builds with each step we make in a positive direction gives us not only the self-confidence to try for just a little bit more each time, but also the resolve to keep at it, even when we don’t feel like it. Each destructive habit replaced by a disciplined and meaningful one clears the way for us to move with intensity toward our success. The key is in gaining this traction and momentum. With this frame of mind, rather than experiencing dread over the thought of developing new disciplines, you will become excited by the process instead. When you remove the stress, you’ll actually enjoy the journey, and will be much more likely to accomplish even the most challenging of your goals.